Many animals can see a much broader range of colors than we can, which helped them to survive. They can see other colors because they have more cones in their eyes then we do. We only have three, short medium and long, and other organisms can have many more and see a wide variety of colors that we can even imagine. Seeing other colors is an important adaptation for most animals. For example the bumble bee has coevolved with flowers to form a mutual symbiotic relationship where the bees pollinate the flowers and the flowers feed the bees nectar. This occurred because bees have compound eyes that allow them to see ultraviolet light and so the flowers adapted by using ultraviolet pigments to lure the bees in. 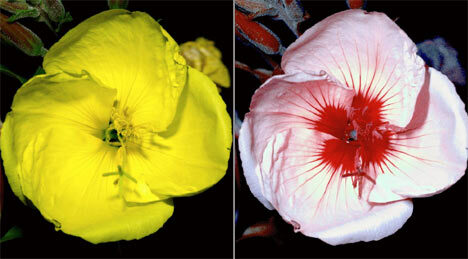 Flowers use unique patterns that act as “landing strips” to direct them to the center of the flower and show the bees where the pollen and nectar are so they will come and pollinate them. So every flower has a hidden pattern that we cannot see.